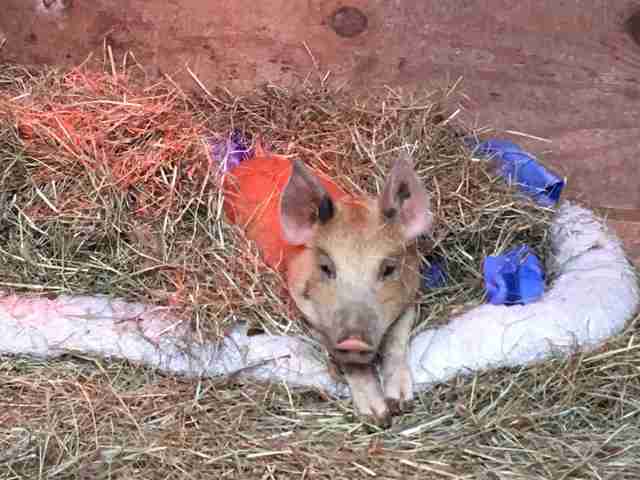 "He handed her over to animal control when they were investigating another call in his neighborhood, and told them he had named her 'Chris P. Bacon,' and didn’t want her anymore." 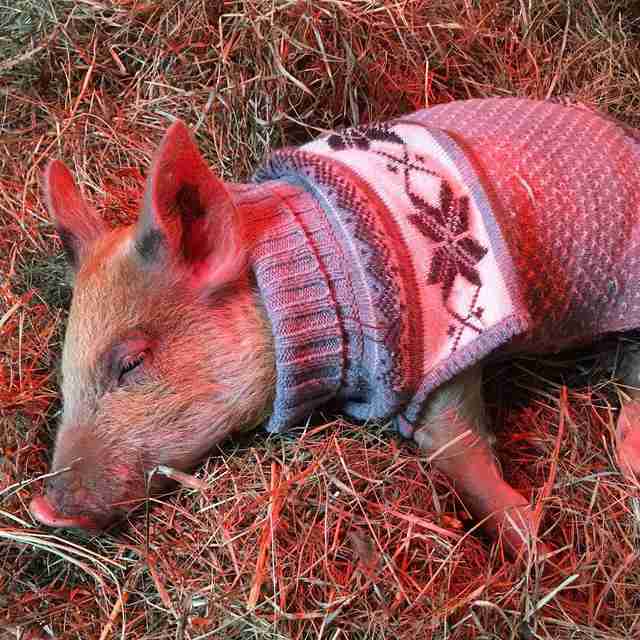 Some people love the idea of "mini" or "teacup" pigs — bouncy, hooved little oinkers just the size of a small dog. That's probably what a man in Washington, D.C., had in mind when he decided to buy a little pig now known as Dani. Little did this guy know, he was missing one very important detail: There's no such thing as a "teacup" pig. 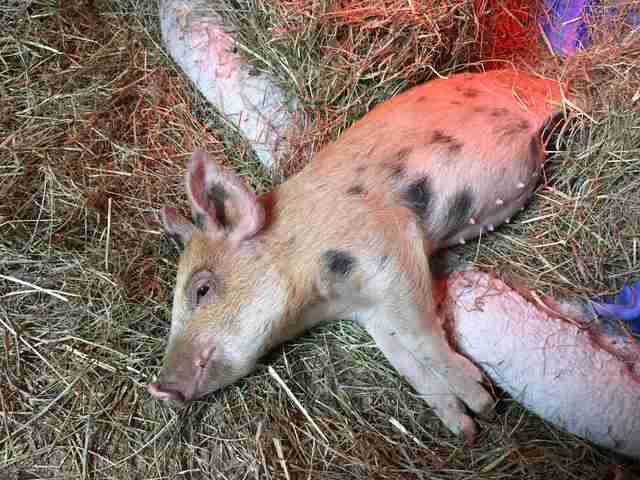 Pet pigs who are sold as "teacup" or "mini" are usually smaller breeds of pigs (like potbellied) that are deliberately malnourished to keep them small or are sold as babies and marketed as fully grown. 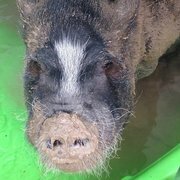 Perhaps the most famous "mini" pig gone wrong is Esther the Wonder Pig: She was very fortunate in that her dads changed their whole lives so they could keep her, starting a sanctuary in her name. But too often, these pet pigs end up being abandoned. And that's just what happened to Dani, who is a Duroc pig. Female Duroc pigs can grow up to weigh as much as 650 pounds. 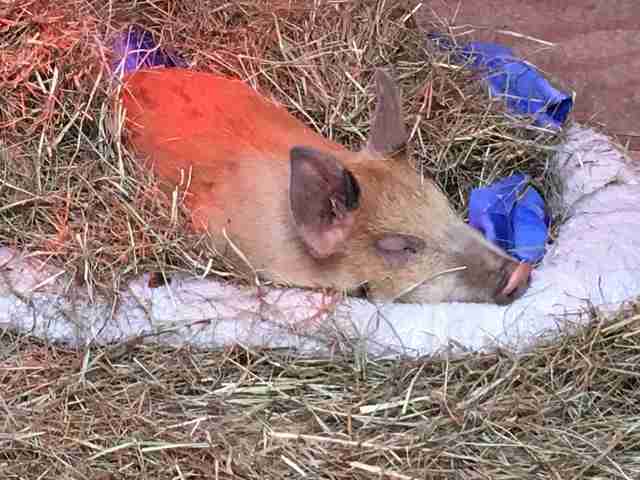 "A man who lived in the city had purchased her as a 'teacup pig,'" Terry Cummings, director of Poplar Spring Animal Sanctuary in Poolesville, Maryland, wrote. "[He] realized when she grew so rapidly that she was going to be much larger." So, recently, when the man spotted animal control officers in his area, he brought his pig out and gave her away. "He handed her over to animal control when they were investigating another call in his neighborhood, and told them he had named her 'Chris P. Bacon,' and didn’t want her anymore," Cummings wrote. Luckily, there were people out there who wanted the pig, just as she was. Cummings agreed to give the little pig a forever home at Poplar Spring — where she would meet new friends and never outgrow her home. That's when she was renamed Dani. When Dani arrived at the sanctuary this week, she happily chowed down on her first meal. And rescuers gave her a sweater and a dog bed under a heat lamp so she could be warm and cozy. Making it quite clear that she was indeed a pig at heart, Dani went ahead and covered the dog bed in hay. The new resident of the sanctuary was also quite determined to explore. "We had decided to let Dani out of her stall for a few minutes, but she had other ideas, and decided to meet the goats instead!" Cummings told The Dodo. "She also refused to go back in her stall and we had to run around with her for a half an hour. We were exhausted, but she had a great time!" 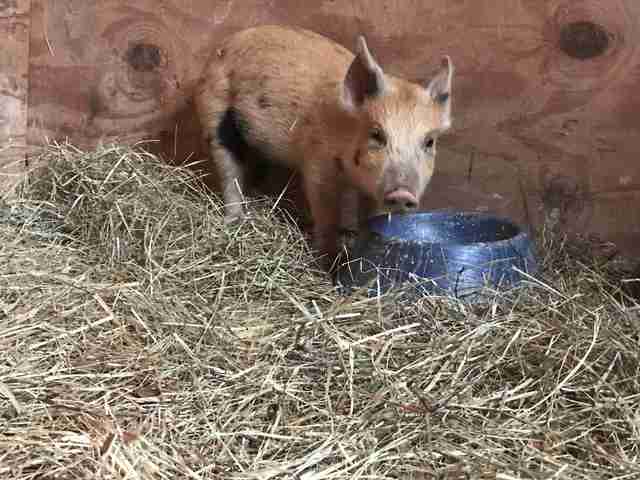 When so many "teacup" and "mini" pigs are finding themselves homeless when they start growing, it's so heartening to see Dani in a home perfectly appropriate for her. "She is adorable — friendly and sweet, and loves snuggling in our laps and getting belly rubs," Cummings added. "We are so happy that she will never be anyone’s 'bacon' and will now get to live a wonderful, happy life that all pigs deserve." You can help welcome Dani to her new home by making a donation to Poplar Spring.